Phal Golden Buddha is a famous hybrid by Pete Lista, registered in 1977. It's unfortunate that I don't know Mr. Lista before he passed away. 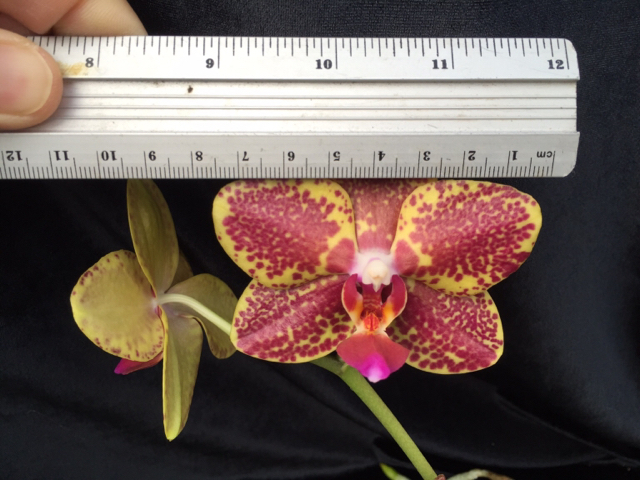 For a while Phal Golden Buddha was the hybrid used to create a larger red phalaenopsis. There are 304 F1 hybrid registered with Phal Golden Buddha. Among these include the famous red like Phal Cordova (x Zuma Garnet) 16 Awards, yellow like Phal Golden Gift (x Deventeriana) with 20 awards. I know this Phal Pylo's Buddha Princess is a tiny plant, but I am excited to see the result. This flower looks like an improved version of Phal Golden Buddha because of the rounder petals. I am glad that the harlequin markings did not come across. I use this Phal Haur Jin Princess for the flower size, shape, and the yellow color. I am planning to use the pollen of this flower with Phal KV Golden Star. If it breeds, then we know that Golden Buddha – near 4n will produce good 4n breedable plants when pair with a 4n pollen parent. This is only the 2nd flower that I'm blooming. Small plant in a compot. So far no harelquin type flowered yet. Maybe the next one (see the bud above this flower) will be a harlequin type - it looks spotted. Congrats and keep us posted on the next one. This is the first harlequin type from this cross. Years ago I would have liked this - but it is not what I am looking for. I am also finding that Phal Golden Buddha is dominate in contributing to its progeny to have reflex petals. I like these yellows with red spots! this is probably my favorite. Large flower 7.5 cm NS - first bloom in a compot. In person this flower looks bright. Now that I like this flower, I guess it's time to repot it.